DALLAS - Direct from the collection of New York Post founder Samuel Boyd, an important copy of The Federalist may sell for as much as $100,000 in Heritage Auction’s Sept. 15 Rare Books Auction in Dallas. 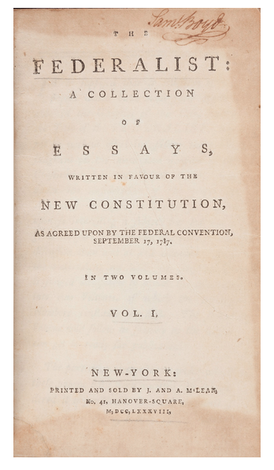 The collection of published essays, primarily written by Founding Fathers James Madison and Alexander Hamilton, convinced New York voters to ratify the newly proposed U.S. Constitution. The auction’s range of historical volumes also includes an influential copy of The Book of Mormon by Joseph Smith, used as a reference by notable anti-Mormon author Pomeroy Tucker ($70,000+). This copy is one of 5,000 first editions printed in 1830 and was actually printed (and also signed and inscribed) by Tucker himself in his role as a press foreman for printer E. B. Grandin. Ironically, Tucker would move on from his printing apprenticeship to become a journalist and New York politician, and he later penned Origin, Rise, and Progress of Mormonism, a book arguing that Smith was dishonest. Modern literary works on offer include a 1923 printing of the first edition of Ernest Hemingway’s first book: Three Stories & Ten Poems. One of only 300 printed, the copy retains the book’s original grayish-blue printed wrappers (est. $15,000+). And a first edition of The Lord of the Rings, including The Fellowship of the Ring by J.R.R. Tolkien (est. $20,000+). · Blood Meridian, 1985, signed by author Cormac McCarthy (est. $6,000). · The Significance of the Frontier in American History by Frederick Jackson Turner, 1893, the first print appearance of this page-turner on the American frontier (est. $3,000+). Want to get the up-to-the-minute updates and breaking news stories about Heritage Auctions? Get them as they happen at: HA.com/Twitter; Facebook: HA.com/Facebook. To view a complete archive of Heritage press releases go to: HA.com/PR. To link to this press release on your blog or Website: HA.com/PR-2992.